Slice the two Bruegger’s Ranch bagels in half, then shred or cut into small pieces. Set aside. Shred the Iceberg lettuce, then set aside. Pour 1 oz of softened Cucumber Dill Cream Cheese and 4 oz of mayonnaise into a large bowl and stir until blended. Taste before continuing. If you prefer a stronger dill flavor, add more cream cheese and stir. Pour 20 oz of fully cooked white chicken into the cream cheese and mayo mixture, and stir until the chicken is fully coated. Mix in the shredded Bruegger’s Ranch bagels and the celery, and stir until everything is coated. Add more mayo if necessary. 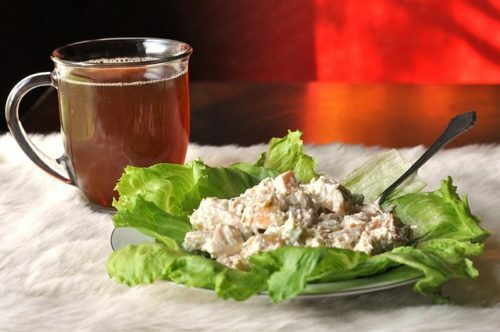 Line bowls with the shredded Iceberg lettuce, and spoon the chicken salad over top. Recipe by Stefanie of Lexie Loo, Lily, Liam & Dylan Too blog.